I am pleased to announce the newest venue for my work…Liquid Art House in Back Bay Boston! Stop in and check out “Glitter Sisters” 56″ x 40″ Oil and Mixed Media on Canvas, while witnessing this truly one-of-a-kind gallery experience! 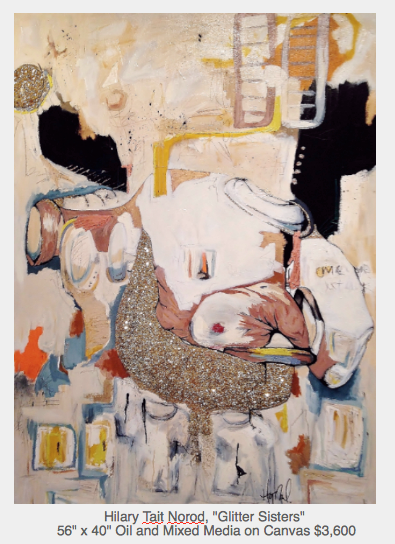 Norod’s Painting “Glitter Sisters” is currently on view and for sale through Liquid Art House. “Glitter Sisters” is part of of a larger series, titled “Couplings.” This series will ignite questions of our own identity within the relationships we value most. The mixed media paintings developed from an interactive study of couples from familial relationships where a multitude of emotions were expressed and then translated abstractly onto the canvas.